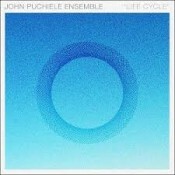 Life Cycle, from composer John Puchiele, is a moving suite of pieces that blur the border between ambient and new classical music. In working the listener through his titular conceit, Puchiele switches sides as the journey goes forward, and the balance is perfect. The ambient work here is soft and drifting. “Thinking” nicely pings spacemusic’s standing tropes with its slow-moving choral pads, rich tenors and angelic sopranos trading phrases in a dreamy mix. “Climbing” is another cloud-motion flow, built on rise-and-fall pads underscored with nice bass tones. It moves easily into “N.D.E.,” an uplifting drift on softly repeating pads, a lulling wash of sound. Like all of Puchiele’s work, there’s a strong emotional core at work here; it’s not just about getting lost in the ambient music, it’s about taking on the feel that’s offered as well. On the more classical side, the two “Life Gets Busy” pieces take an interesting tack that will certainly conjure thoughts of Steve Reich. Strong minimalist strokes power both; “I” is a string piece, played in short, sharp notes with a bit of a sense of urgency. Late in the track, a high repeating phrase comes in counterpoint and the whole piece works its way up to a wonderful density of sound. On “II” Puchiele takes to the piano and lays out a rapid-fire barrage of notes that could be equal parts Reich and Philip Glass. Again, the base is minimalist but increases in complexity and intensity to reach a perfect expression of its title. “Foundations,” another piano piece, makes use of heavy notes and the potency of sustain to mix a melody with its own created harmonics. Puchiele alternately patiently waits out the sustain before proceeding or simply folds the next notes into it. For a short piece, it’s very memorable, and drives its point home nicely. Life Cycle moves effortlessly from one track to the next, creating a sensible narrative as it goes. It’s calming in spots and potent in others, but always engaging. Puchiele’s playing is elegant, often because of its apparent simplicity. He’s taking set phrases, short, tight elements, and setting them gently in place. The result is deep–certainly as deep as you care to listen. A gorgeous work that should get much repeat play, and a contender to make “Best Of” lists across the genre this year. Available from John Puchiele’s web site. Yellow6 and David Newlyn: O.S. I play the life cycle in a reception area and in a yoga studio to strong response .